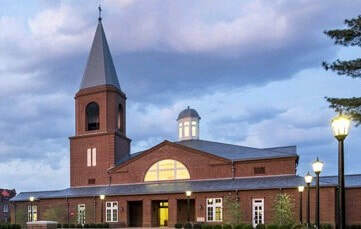 There are reserved handicapped parking spaces near the drop-off quadrangle that is adjacent to the front entrances of both the chapel and the Welcome Center, where coffee and Forum Hours are held. Assistive hearing devices may be obtained from the ushers. Large-print copies of the Book of Common Prayer are available; an usher will be happy to assist you. Gluten-free Communion hosts are available on request from the clergy. ​​There is reserved handicapped parking near the church. A wheelchair-accessible, ramped walkway leads to entrances to the church and parish hall, where coffee and Forum Hours are held.